I tend to put aside weekends for my family and loved ones, but on occasion I do allow myself a brief escape to do something for myself, so I can come back home reinvigorated and ready to nurture. 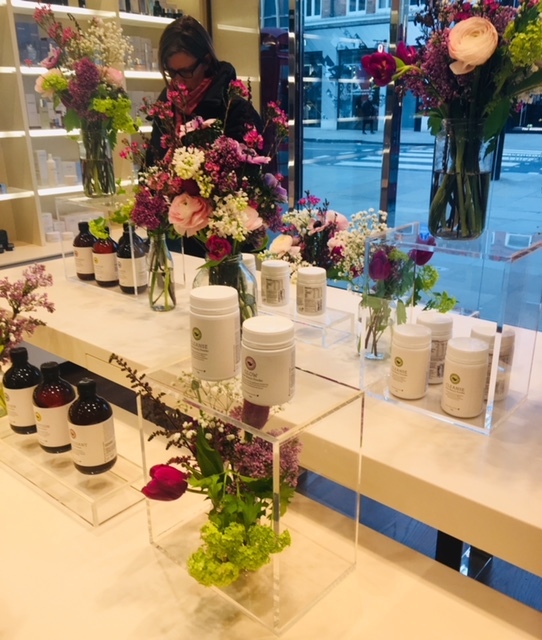 Having been a fan of Carla Oates, founder of The Beauty Chef, I reorganised my schedule in order to make the 9am event with her at SpaceNK store in Chelsea a few days ago. Carla was in London visiting from her home in Australia to meet up with her retailers & customers and do various panels and events. Having left home on time, my progress was nearly stopped in its tracks by the announcement at Euston station that there were signalling problems on Victoria line and alternative routes should be used – it would have been helpful to get that announcement straight away and not after sitting on the train that refused to depart for ten minutes. I ran for the black cab (I might be a dinosaur, but I don’t have an Uber app), who not only made sure I arrived on time (nearly miraculous, might I add), but also was a great source of a factual conversation, on subjects ranging from Uber to current Mayor, political upheaval and double standards. Grateful for being on time and fuelled by an interesting conversation, I entered the store where staff and women (one came along with her young daughter) were waiting for Carla. We were offered some juices and a few nibbles and then a smiling woman with long flowing hair and dressed in a pretty, but unassuming long olive dress with side pockets, emerged from the back room. Smiling, she proceeded to tell us about the passion that fuels her life – nutrition. Carla wrote her first book, ‘Feeding Your Skin’ thirteen years ago, thanks to the team at Penguin publishing. Since then, alongside raising two children, who are now 20 and 17, which is hard to believe as Carla hardly looks a day over 30, continued to research organic and natural solutions for radiant skin and gut health. Her own journey included allergies and eczema as a child, but thanks to Carla’s mother, who has overhauled her diet, she quickly learnt about the close connection between diet and healthy skin. Carla worked as a journalist and fashion stylist, but from early on had a passion for natural skincare and holistic approach to lifestyle, at the time when very few people paid attention to it. So when her daughter developped eczema, Carla was quick to eliminate dairy and gluten from her diet and zeroed on fermented foods, which was the foundation for her first product for her brand, The Beauty Chef, called ‘Glow’. Sadly in our day and age, we don’t consume enough of good bacteria daily, due to the over-processing of our food. Often we feed pathogenic bacteria, when instead we need to be nurturing the good bacteria’ that is responsible for up to 2/3 of our immunity in our second ‘brain’, our gut. Our gut also produces more than twenty unique hormones. Carla pointed out that we are ten times more bacteria than cells, so it is important for our body’s fabric to be healthy. So it is never a good idea to underestimate the importance of our daily nutrition and make sure that we have broad spectrum strains of bacteria in our gut, by ‘implanting’ and feeding pre and probiotics in our gut. We might think we are eating well, but examine the state of your hair, skin and nails – they are the last ones to get ‘nutrients’ from our body, so are a good indication of how healthy our diet and nutrition really are. Like a litmus test of sorts. According to one of my favourite books about gut (if you already don’t have it, I urge you to buy and read ‘Gut’ by Giulia Enders), ‘while 100%of the cells that make us up when we start life are human cells, we are soon colonised by so many micro-organisms that only 10% of our cells are human, with microbes accounting for the remaining 90%). Yet only in the last few years we are starting to read more and more about gut health and slowly but surely there are also scientific papers offering insights into the functioning of our gut, as well as offering us tips on how best look after it. Considering that Carla was one of the pioneers when it came to gut supplementations, she falls into the ‘leader’, rather than ‘follower’, hence my interest in her work and the use of her supplements in my own diet. ‘Glow’ was launched in 2009 and at the time retailers didn’t know in which section to put Carla’s supplement, as the segment of ‘wellness’ was in its naissant state. Carla developed it for daily gut maintenance and said that the initial reception of retailers was ‘weird’. But thanks to word of mouth, the word started spreading and even her husband’s work colleagues (he works in plumbing) now make regular ‘requests’ not just for the Beauty Chef’s Protein powder (comes in chocolate and vanilla), but for ‘Glow’ too. ‘Glow‘ is the supplement that was developed ‘to make you look and feel great’, according to Carla. It is a supplement for daily gut ‘maintenance’, which has a ‘mother culture’, based around the starter culture and fermentation yeasts, that are macerated for 6-8 weeks (something that can’t be speeded up, even when retailers ask for more stock, but Carla now has bigger production facilities). With the added macro algae, beta carotene, antioxidants, queen garnet plum (native to Australia), Vitamin C, zinc, seeds, legumes this powder, which can be added to water, smoothies, cereals according to your tastes, is a powerhouse the effect of which you hopefully will see in your skin and possibly the way you feel within a month or so of taking it. According to Carla they have also done some clinical trials that show an improvement in certain pre-existing skin conditions with regular consumption of ‘Glow’. ‘Cleanse‘ is a supplement that Carla recommends taking four times a year ( I have done it twice last year, in autumn and in springtime). it was developed for times when you are stressed, overindulged regularly in processed foods or when you travel a lot. It helps to balance or restore your digestive system, while also assisting your body’s own daily detoxing process. Carla also created ‘Inner Beauty Boosts’, which are ‘like serums to your moisturiser’. They come in liquid, not powdered form, and are called Collagen, Hydration & Antioxidant Inner Beauty Boost. We start slowing down in producing our own body’s collagen from the age of 25, so Carla included bio-fermented berries, which help our body’s collagen synthesis process. Antioxidant boost includes papaya and green tea, which help boost your body’s immunity and digestive process. As to Hydration, most of us probably don’t drink enough water daily – the simplest thing that we can but fail to do daily, noticing the cumulative effect in our skin. Carla’s boost tastes like a ‘healthy pina colada’ and includes lemon myrtle and natural electrolytes. As to Protein Powders, of which I am a big fan, as there are always occasions when I have a busy day and don’t have the time to sit down and eat a proper lunch, a good quality one always offers you a liquid meal that will help sustain your body until dinner, without compromising your body’s nutritional needs. Carla’s powders are created around sprouted pea protein, which is easily digested and absorbed by the body. The product contains more than 40 certified organic ingredients, as well as fibre, which will help you feel fuller for longer, antioxidants and Vitamin C.
Later this year Carla also plans to launch a powder formula that will help those of us who have trouble sleeping and I hope that she will come to London again to share her tips and experience about SLEEP Inner Beauty Powder, that has already been launched in Australia. With her open and friendly personality, she is easy to talk to and as a mother of young children I can relate to her too. I asked her why we need to use supplements, which our grandmothers and mothers didn’t use, yet they were fine. Most supplements nowadays don’t come cheap and if you take several of them daily, the overall cost can be quite cringe-worthy. Carla didn’t shrug the question off, instead acknowledging the issue. She said that in her opinion previous generations might not have had the food variety we do now, but they ate in season, food came from the soil that isn’t as nutrient depleted as it is now and there weren’t antibiotics and genetically modified seeds used in crops. We both chuckled remembering how we both picked food off the garden grids & bushes ( potatoes in the autumn, variety of salads and berries in the summer at my parents country house in my case), we didn’t necessarily wash them, eating them there and then, ingesting soil particles. Our guts were exposed to kefir and kombucha and no-one made a big deal out of it. Nowadays the picture of nutrition is completely different and many things that were beneficial for our bodies and guts have been phased out, giving way to pesticide-sprayed crops and germ-killing hand sprays. Many of us dash with hand wipes, as soon as our toddler touches something outside, be it a stick, a flower or a fallen leaf. Our mothers didn’t do that and yet we turned out to be just fine. Ultimately it’s not just genetics that determine our livelihood and wellbeing, so it’s worth taking the time to learn more about supplements before we take them or give them to the children. Eating fresh and in season, buying food from local markets, cooking at home involving, when possible, our other halves and children, talking about food and paying attention to how this or that food makes us feel – all those things matter, as do the supplements we choose to pop into our mouths or mix into our drinks or breakfast cereals. I enjoy cooking using the recipes from Carla’s book ‘The Beauty Chef: delicious food for radiant skin, gut health and wellbeing’ simply because the recipes are nutritious and benefit our bodies and not because it has beautiful imagery and is written by someone well-known. We only have one health and looking after it is not a matter of here today, gone tomorrow, which many celebrity endorsed products are all about. It is about enjoying everyday food, giving your body what it needs in the moment in time to thrive. And supplements should compliment what you eat, not be the latest fad that you momentarily decided to follow. For more information about Carla and The Beauty Chef please click here The Beauty Chef is sold in the UK at various retailers, in-store and online, including SpaceNK, Selfridges, Content wellbeing Naturism, Cult Beauty and others.